‘The rose-red city half as old as time’, the words used to describe the ancient city of Petra by poet John William Burgon. Petra comes from the Greek word for rock. Quite fitting for an entire city carved into the red sandstone cliffs. Petra has a fascinating and mysterious history and is on many bucketlists rightfully so. Petra is also known as the “Lost City” as it was abandoned for centuries after a devastating earthquake. It was rediscovered by a Swiss explorer named Johann Ludwig Burckhardt in 1812. Petra was named a UNESCO World Heritage Site in 1985 and is known as one of the 7 New Wonders of the World. Today, it is estimated that less than 2% of the sites are excavated in Petra, yet you could spend several days discovering all the remains and hiking trails of the monumental city. I recently spent a few days in Jordan and was determined to find the most epic views in Petra, and I think I found most of them! I honestly wish I had one more day as I just scratched the surface of this amazing place. 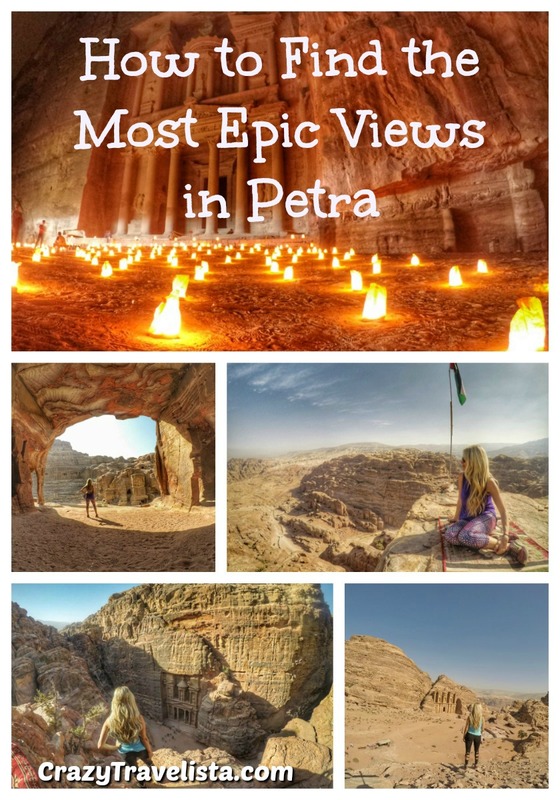 Below I have highlighted the most epic views in Petra, as well as how to find them (some are kinda hidden so hopefully this guide will help you find them easily). The high sacrifice is a holy place that was used for animal sacrifices and is located on the summit of the Attuf Ridge high above the Royal Tombs and main trail. The peak rests at around 550+ feet. From here, you can see most of Petra, excluding the Monastery and Treasury. You will look right down to the royal tombs across from you. There is a little shack with coffee/tea and trinkets at the top and it’s hard to resist sitting at the very edge of the cliff sipping coffee with the epic view. About 40-ish minutes, depending on your fitness level. I have read articles that says 1 hour but only if you go at a snail’s pace. About 5 minutes after the Treasury, it will be on the left side. When you see the shop called “Why Not Shop” , look for the steps on the left. You’ll see a brown sign. If you see the amphitheater, you’ve gone too far. This might be the most epic view you can get in Petra and takes a steep hike to get to with many stairs. The walk takes about 45+ minutes to get to the top. I would definitely go first thing in the morning to beat the heat and the crowds. I went around 6:45am, at the top around 7:30am and absolutely no one was there. It was awesome to have the place to myself. About 5-7 minutes past the Treasury, you will pass the Street of Facades and public bathrooms on the right. Right after the bathrooms, you should see some little steps and a brown sign saying Al-Khubtha Trail. Take the steps up and you should pass the Royal Tombs on the right side. You will then reach the bigger/steeper steps. Follow that up and you will see a few more signs saying saying “Come and Sit and Enjoy The Spectacular View of the Treasury From Above”. There is a sign at the top pointing with an arrow to the rocks saying “Best View” where you will get a side view of the Treasury. But in my opinion, the best view is actually from the Bedouin type tent thingy about 2 minutes past this. You can see the Treasury straight down from there! The Monastery is arguably the most epic site in all of Petra, bigger and more badass than the Treasury. It takes a strenuous 45 minute hike to the top. But the best views aren’t from there. The best views are from above. Walk past the Monastery and cafe and you’ll see a hill. Climb up the hill and on the left you’ll see a sign that says Do “Not Miss This Spectacular View”, another one that says “View Wadi Araba Water Spring”, and “Grand Canyon View, Best in Jordan”. Climb to the first platform and that’s where you will get the best view. You can go higher to a little cafe, but the views aren’t as good as from here in my opinion. You get the Monastery from the distance as well as the vast Petra landscape framing it. One of the best views over Petra where you can relax and sip on some very yummy tea is at a cafe located 10 minutes past the Monastery.The cafe is decorated Bedouin style with the colorful floor pillows and tables. Have a mint tea and enjoy the views. There is a cute and super friendly kitty that lives there too! A bonus if you ask me. If you come down from the Monastery view and keep waking up the hill, you will see signs that says “Grand Canyon View, Best in Jordan”(btw, if you haven’t yet noticed from this article, there are tons of signs in Petra that will claim the “best view”, that’s for you to decide!). Walk to the top to the cafe for a panoramic view of the mountains. This is a definite a MUST if you’re visiting Petra. It only occurs 3 nights a week (Monday, Wednesday, & Thursday) so make sure to plan accordingly. This was the highlight of my Petra trip and the only way I can describe it is MAGICAL. The Siq opens right up to the Treasury at the end and that first sneak peak through the narrow gorge is EPIC. It brought me to tears seeing the Treasury and all the candlelights surrounding it. What a great introduction to Pera! You really can’t miss it as it’s on the main trail. After you get your tickets at the visitor’s center, proceed to the walk through the Siq. It takes about 30 minutes from the entrance to get the the Treasury, but half the excitement is walking through the narrow path illuminated by candlelights. I must admit I have never seen photos of the caves of Petra, as they are overshadowed by the Treasury and Monastery. The caves are made of swirly marble patterns and were so beautiful. They also provided a cool escape from the heat! Walk past the Street of Facades and they will be on your right before the Royal Tombs (if you see the Amphitheatre, you went too far). You can climb up into them and it gives you a nice alternate view of Petra that’s pretty damn impressive. The Siq is the gateway to the city of Petra and is a long narrow gorge with twists and turns that ends with a dramatic opening right smack in front of The Treasury. The Siq is around 1.2km long and is anywhere between 3 and 12 meters wide. The cliffs are as high as almost 600 feet in some parts and the walk alone through the Siq is filled with many photo ops. You have to go through the Siq to enter Petra so you literally can’t miss it! Here is my more detailed review of World Nomads if you’re interesting in their coverage. Have you Been to Petra? Do You Have Any Other EPIC Viewpoints you Would Recommend? Please Share Below! I haven’t been to Petra but have always wanted to go. I’d really like to take my son when he is a bit older. Those views are spectacular but I’m not sure I’d be courageous enough to sit on the edge of those cliffs, lol! It seems like you almost had the place to yourself. What an awesome trip! Ahhhh these photos are amazing! Petra is so high up on my wishlist. So jealous you actually made it there! Such an epic trip! Can’t believe I waited so long to go! Petra looks absolutely incredible (as does the rest of Jordan)! Thanks for sharing your photo tips – I’m hoping to visit in the next few years and will save this post for then! Petra was incredible. I wish I had more time to visit other areas in Jordan!